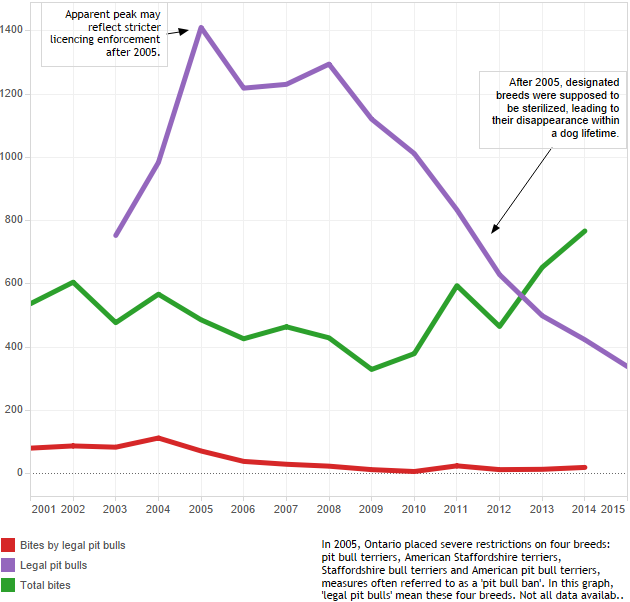 In effect since 2005, Toronto's Breed Specific Legislation (BSL) has 100% failed to prevent or reduce serious dog bite incidents in the city. In fact, dog bite incidents in Toronto have risen 57% while BSL has been enacted (from 486 in 2005 to 767 in 2014). Why have dog bite incidents increased in Toronto (a major metropolitan city with a population of almost 3 million) with BSL enacted? Attempting to reduce dog bite incidents with BSL has not only been proven ineffective by multiple peer reviewed studies and also in actual practice, but it is a red herring for public safety since the legislated (or banned) breeds are eventually replaced by other strong breeds (too many to list) which are also capable of serious bites, fatalities, and other bite-related incidents. Any declines in bite incidents from BSL are always short-lived because as one or several breeds are phased out, other strong breeds replace them (aka "breed rotation"). BSL does nothing to prevent breed rotation or the irresponsible ownership of other strong breeds - only comprehensive breed-neutral regulations are effective for reducing bite incidents long-term by regulating potentially dangerous dogs of all breeds. In 2005, if Toronto had worked on strengthening breed-neutral regulations instead of BSL, Toronto's bite-related incidents would almost certainly have been reduced and more importantly - those reductions would still be in effect today resulting in a true improvement to public safety. Instead, Toronto will need to go back to the drawing board if they truly want to reduce dog bite-related incidents in the city and improve public safety. ​While politicians in Toronto continue to refuse to acknowledge the facts and the failure of BSL, the silver lining is that Toronto is yet another city providing data and evidence that BSL is ineffective and does NOT have any positive impact on public safety. Learn more about BSL, and why Breed Neutral Legislation (BNL) is the more effective and widely preferred standard, on the Breed Legislation Page.